When we moved to rural Mallorca, I was itching to start the novel I’d always wanted to write, but there were a few small challenges. Firstly, the finca we’d bought needed quite a bit of work to turn it into a comfortable permanent home, rather than the rustic holiday home it had been for many years. Our days were filled with DIY, painting, varnishing, cleaning up the inevitable mess that results from home improvements, and undertaking shopping expeditions for various items of furniture and other necessities. My spare moments were spent recovering from all this, rather than writing. There was also the small matter of electricity – which we didn’t have for the first eight months we lived here. No electricity meant no computer, so any writing would have had to be by hand, using a pen or pencil and paper. And for me, for some reason, the words just don’t flow unless there’s a keyboard and screen to accept them. How I envy those writers who can sit with a notepad and pen, committing their mots justes to paper. It just doesn’t work for me. Once we had electricity, I began to make up for lost time, and I’ve now had several hundred articles published in Mallorca-based magazines and a few publications in the UK. But I’ve made little progress with writing fiction. Several short stories sent to women’s magazines in the UK have been rejected, and the novel has stalled at 20,000 words. One day . . . However, I’m thrilled skinny (oh, I wish) to have had some success with a short story (only my second to be published), entitled Embracing the New, which appears in the third anthology, Foreign Encounters, published by Writers Abroad http://www.writersabroad.com/ today (October 24th); the stories, articles, and poems included have all been written by expat writers living around the globe. Author Julia Gregson, a former expat whose bestselling novel East of the Sun won the Prince Maurice Prize for romantic fiction, has written the foreword. All proceeds from the sale of Foreign Encounters will go to Books Abroad, a charity which co-ordinates the donation of books to schools throughout the world. The charity celebrates its 30th anniversary this year and has supplied more than 1,600 schools with books. 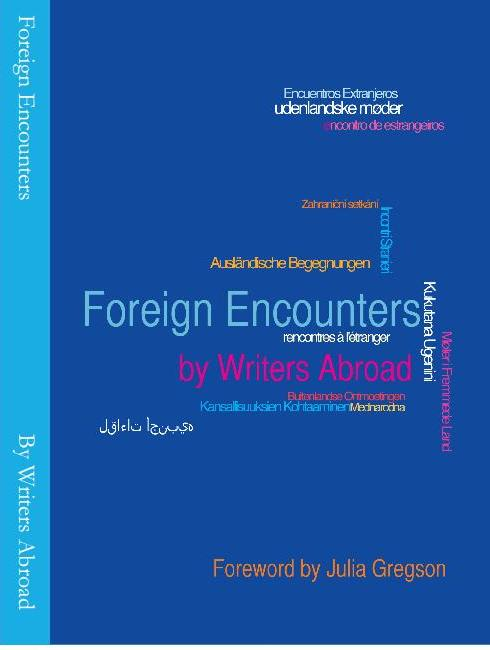 Foreign Encounters is available from Lulu, price €9.99 (approximately £8.00), from today, Wednesday 24th October: http://www.lulu.com/shop/writers-abroad/foreign-encounters/paperback/product-20450826.html. Well, Christmas is coming and this would make a good stocking-filler . . .
Thats fantastic ! Congratulations Jan !! HI Jan! Great blog thanks for sharing with us all the beauties of the island! I think we are really privileged and blessed too! We’re having a book launch for Foreign Encounters in Dhaka, Bangladesh! Thanks, Lee! Next I guess I should go for a whole book, rather than just a short story!! Loved your short story in Foreign Encounters! Looking forward to seeing more of your writing. I’m making a Twitter list of fellow contributors. Are you on there? Thanks, Chris, for visiting my blog and commenting. I am glad you enjoyed my story. I’ve been so busy that I’d only read the first two contributions in the book, but have now read your account of life with your grandmother-in-law in Vietnam. What a fascinating place it must be to live, with so many cultural diffences. Do let me know when the book is out – I’ll be sure to buy it. Yes, I’ve just signed up for Twitter. I’m Jan Edwards (JanEdwa69009249).